This AONB consists of a number of areas of hills centered on Church Stretton. The hills are known for the variety, extensive network of paths and wonderful scenery. The most popular hills are the Long Mynd but others including Wenlock Edge, the Stiperstones and those around Clun are also gaining in popularity. An area located along the Anglo-Welsh border. 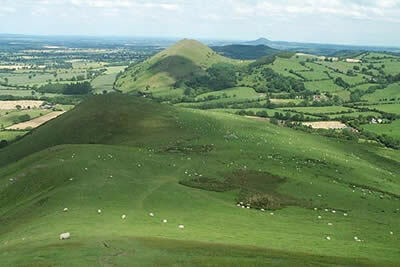 The Shropshire hills are aligned from southwest to northeast and include the Long Mynd and Stiperstones, Clun Forest, the Clee Hills, Stretton Hills and The Wrekin. These five distinctive upland areas each has its own character especially in respect to the landscape. The village of Church Stretton lies at the centre of the AONB with the Long Mynd to the west and the Stretton Hills to the east. Isolated from the other hills, the Wrekin is a volcanic outlier. Elsewhere in the county the Clee Hills are mainly sandstone with a hard basalt cap. In contrast the softer landscape of Wenlock Edge is due mainly to its limestone base. The open moorland of the Stiperstones Ridge is a National Nature Reserve and includes some dramatic quartzite outcrops. The hills and high land of the Clun Forest has a particularly noteworthy traditionally farmed landscape with small fields enclosed by hedges and oak woods. This AONB has no large towns with Church Stretton, Craven Arms and Clun the most important centres in this rural community. Just outside the AONB lie the larger developments of Shrewsbury and Telford. Providing an area for recreation visitors come from within the county and further afield including the West Midlands. From a walkers perspective the Shropshire Hills offer excellent scenery, a generally well maintained network of footpaths, bridleways and quiet country lanes and views as afar away as mid-Wales and Snowdonia. Each of the sub-areas of this AONB has something to offer walkers with the Long Mynd perhaps the best known. However the Stiperstones and Clun are also attracting increased levels of attention as their footpath networks improve.